Last year, I wrote about my 2018 word for the year. My word was, “Home.” Little did I know when I released that blog on January 16, 2018, that the Lord was about to do something incredible as it related to “home” for my family. As I wrote in the blog, I’d been asking God to move us for at least ten years. I’m a girl that thrives on change (and not always because something is bad, but simply because new and different is exciting and refreshing). My husband, on the other hand, isn’t big on change. Typing these words makes me cringe a bit because whenever you mix “want to” with “I don’t want to,” something like a volcano-like science experiment usually erupts and gets everything around it a little messy. Blown up and a little messy is precisely what most 2018 was for us as God let us know that it was finally time for us to relocate “home.” It wasn’t the place we had asked for. He put us somewhere entirely different and completely unexpected. As the pieces for our move fell into place (with craziness at every curve), we packed up our belongings and left the city we called “home” for twenty years. The Lord sent us to a place that wasn’t entirely unfamiliar, but it was a place we had never lived before as a family. Some in my family were excited, and some, not so much. I believe we hit every level of the emotional spectrum during the moving process. Deep down in my soul, I know that the Lord has moved us to this place for many reasons. We have already witnessed miracles that would have never taken place had we not moved here. We are still a little unsettled as we finish up a renovation and aren’t yet in our new home, but the Lord is so gracious. Late last year, God began to plant a word in my heart for 2019. The word He gave me? “Contentment.” That’s right, contentment. Sometimes in today’s world, contentment feels like a bad word, a lazy man’s (or woman’s) word. Those are the words people equate with “making it,” all the while, the Holy Spirit whispers to the redeemed, I’m enough. Be grateful. Don’t get comfortable with your stuff, your position, or your blessings. Rest in me. I’m your sole source of contentment. I’ve struggled with being content for as long as I can remember. I often feel unsettled, and I can’t always put my finger on it. But just as with every work the Lord has done in me, I know there is a reason for the process. If contentment is what I need to meditate on this year, I am trusting and believing there is a reason for it. The word “content” appears in the Bible in both the Old Testament and the New Testament. It’s funny, though, when I was jotting down notes next to the Old Testament verses (Joshua 7:7, 1 Kings 4:20, and Proverbs 3:25), my notes looked a whole lot different than they did for the New Testament references (Luke 3:14, Philippians 4:11, 1 Timothy 6:6, and 1 Timothy 6:8). 1 Timothy 6:6 — shows us the why. “Yet true godliness with contentment is itself great wealth.” Contentment comes with reliance upon the sufficiency of Christ. He is enough. All the responses I jotted down for the Old Testament are valid because they are filtered through the sufficiency of Christ. If the Israelites had stayed in Egypt because they were content, they would have died as slaves. If the people hadn’t followed Solomon’s godly leadership, they would not have had good times in which they could be content. Obedience has its perks, and with it comes contentment. However, on the flip side, feeling unsettled and not willing to be content is also okay according to the Word of God. Lot should not have been content with his lot in Sodom. He grew accustomed and content with his position in a sinful city. Rahab didn’t remain content to be a clever businesswoman who knew God from rumors. She risked her status, and her life, to know God. Paul learned to be content whether he was in jail, out of jail, on his way to jail, cold, warm, hungry or full. 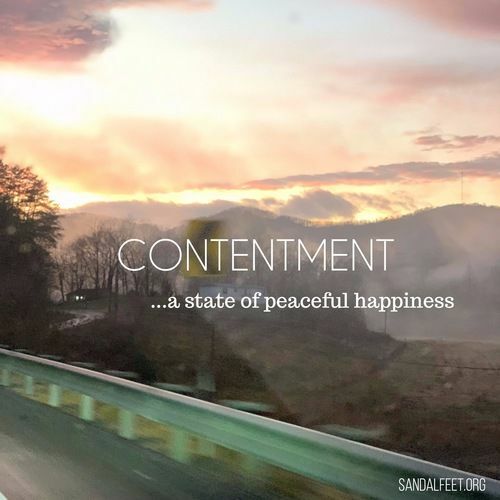 What I have learned in just these few short weeks of 2019 is that contentment has so much more to do with just being okay with the stuff I have, the title I carry, the husband I have, the children I am raising, or where I live. It is being okay with Jesus as the center of all things. I think I sometimes confuse “comfort” with “content.” Thankfully, comfort is not my word this year because that might get, well, a little uncomfortable! My word is “contentment” (I’m saying that out loud so you all can hold me accountable) — being fully reliant upon the sufficiency of Christ. Whatever that looks like in 2019 is still unknown to me but known by the Lord. It gives me great peace to know that He reigns and is in control. One dictionary defines the adjective version of content as “a state of peaceful happiness.” May this be written of me on my epitaph one day, “Erin lived in a state of peaceful happiness because Jesus is enough." What’s your word for this year? What area(s) is the Lord working on within you?